The TiVo kickstart 54 code allows for you to test your hard drive(s) using the TiVo itself. These operations take some time, and your TiVo won't be able to record or playback while these tests are taking place. 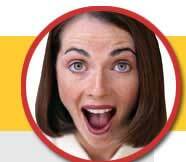 See the main TiVo kickstart page for information on how to get into the kickstart menus. Then see the information below on how to proceed. Choose your test option here. We recommend the top option, the S.M.A.R.T. test and then move to successively longer tests if the prior test passes. NOTE: If you have TiVo Series4 (Premiere-line) or TiVo Series5 (Roamio-line), you MUST choose the top test (S.M.A.R.T.). All other options will result in an instant failure, even if the drive is perfectly fine. If you choose the top S.M.A.R.T. test, the TiVo will automatically perform more thorough tests after the S.M.A.R.T. has completed. 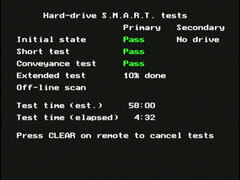 This screen shows a TiVo HD testing its internal hard drive.